Looking at a route-fresh find: If you could get a Scared Stiff or a LOTR for about the same price range, which would you choose and why? Conditions, I'm thinking are basically equal. Working but routed-quality, semi-worn playfields, plenty of back box hacks in both but all salvageable for the right price. I've played a collector-quality SS and liked it but I could see where it might get redundant over time. I've briefly played a beat-up LOTR and I see where a good one could be awesome. I would probably do a moderate restore, correct the hacks, play for a couple years and then sell or trade later. LOTR long ball time and deep rules. SS shorter ,still alot of fun. SS all day long. Theme, fun, art. Not even close. Ss is a pretty game, the callouts are great and its a lot of fun, but it's way too shallow and easy for my taste. I recently sold my ss after not owning it very long and I've had lotr about 3 years now. (Poll added) -- thank you for the responses and feedback - this definitely helps. I had both and sold SS. For a smaller collection, SS runs its course too quick. LOTR just had more to do and deeper rules so its a longer term keeper. For a larger collection, SS is a keeper and has one of the best themes. I think they are both fairly equal choices but with very different tradeoffs. Looking at your collection I think SS would be the most suitable addition. You've got plenty of games that are similar to LOTR but nothing like SS. SS is fairly basic, sure, but you've got a big enough collection that you can go to something complex with long ball times if that is what you want. SS is a great game to play with buddies and is a particularly good game to introduce to new players. I've owned both, and still have SS (and will likely never part with it). LOTR is fantastic - great deep ruleset, fun shots, etc. Really can't go wrong with it unless you don't like the theme. Despite parting with it, it is in my top 3 favorites. For me, SS is all about the theme - I am a huge Elvira fan, so that goes a long way as to why it will never leave. The callouts are hillarious, the lighting is awesome, and to me, it is just a fun game to play. Even though I have owned it for over 4 years in my small collection, I still love playing it. I am not the best player, so starting the Stiff-O-Meter is easy, but completing it is a challenge for me (I get too excited and choke, heh). I've never even come close to completing the spider wheel. It is not the deepest game, that is for sure, but I appreciate it for that...pairs very nicely next to my Twilight Zone. So...it really depends what kind of gameplay you are looking for. In my book, you can't go wrong with either one. Thank you again, guys. It's really helpful to get different eyes and opinions on it. See, I like the theme of SS - alot and I do like the flowiness of it. The stiff-o-meter heartbeat is awesome, as is the coil freak out thing that follows.. I'm not really a LOTR fan but I know it is an epic pin that I just haven't discovered enough yet to appreciate. I did like the shots and the the look of the game and I usually like a deep game but - variety is good too. Impressions on the parts acquisition difficulty on SS? ...as is the coil freak out thing that follows. Lotr does the same thing when you destroy the ring, probably took that from SS. I've had both. SS is long departed, LOTR is back for the third (and final time). SS is great for humour, but as others have mentioned, not deep in the rules department. Buy both, clean them up and sell the one you don't like after a month. No way you can possibly lose money if you're in it at the right price. Both are very in demand games. 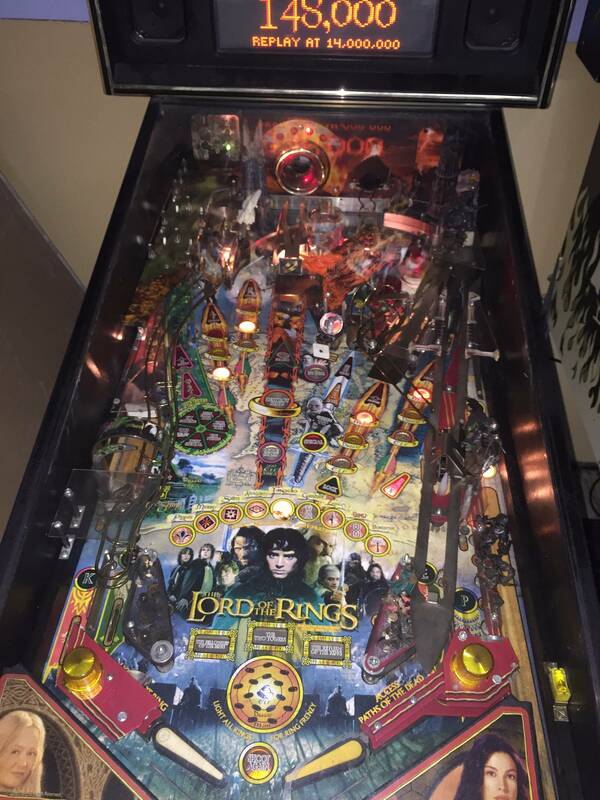 Not a LOTR fan, The game was fun but I found myself avoiding it because of long ball times. I couldn't take the rings of men call out anymore either. Scared stiff is still here. However I agree with the others where it's better in a larger collection. Both are totally awsome, but totally different from each other in the depth department. I'm going to try to go by and get a better look at the Scared Stiff they have this weekend. 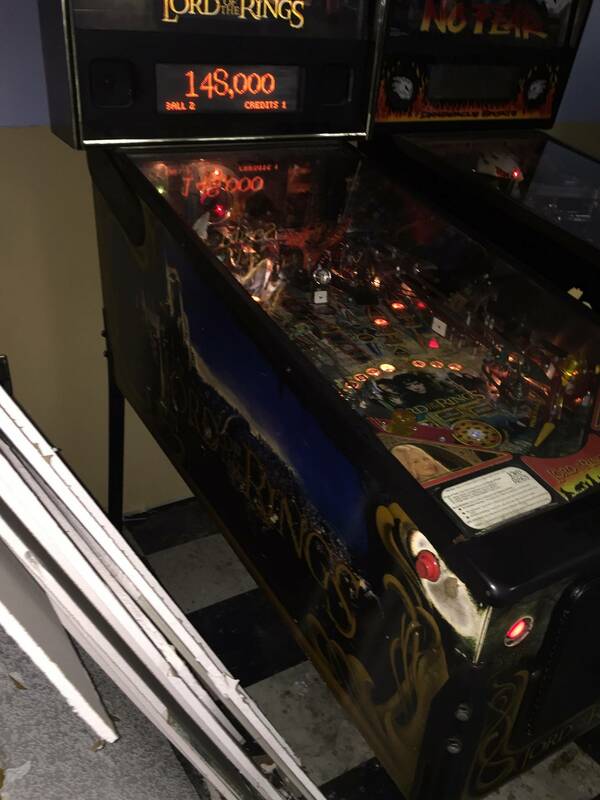 They have it priced at $5k (off route), which I dunno maybe that's high or maybe it's good, I guess condition will dictate the action from there. I thought about offering them something on both pins.. So I scoped out LOTR today at lunch (it is still on location somewhere). Looks like my friend that scoped out the condition of the LOTR, left some things out. Like: the condition of the side art. A few scuffs I could deal with but dang those button areas are rough, I don't even think the new Stern rails would adequately cover that up and I'm assuming LOTR reproduction decals still aren't happening, right? The PF is all there but she definitely has that route-y level of freshness to her. I don't have an offer from the op that owns this yet but I'm guessing they will end up coming in high. What is fair for a routed LOTR like this? I'd like to give this pin a new life but that side art thing might end up being a showstopper anyway unless I can find a good artist to do their thing to it. Haven't seen anyone making repro decals for the side, did I miss it? I have actually walked away and left balls in play on LOTR on location. One of the most boring games ive ever played, couldnt wait for it to end. Ive had SS about ten years. Yes its not that difficult but its fun in a bigger collection and beautiful to look at. All depends what kind of games you like. How long do you want it to take for you to beat it? 2 weeks or 2 years? If you don't buy the LOTR, let me know. Neither. I find them both boring. Flame suit on! I will! -- They are supposed to decide this week. I'm trying to help them move some of these games - I like this operator (a couple). Their prices aren't steals or anything but they are pretty easy going to deal with / not acting like they are sitting on government secrets. 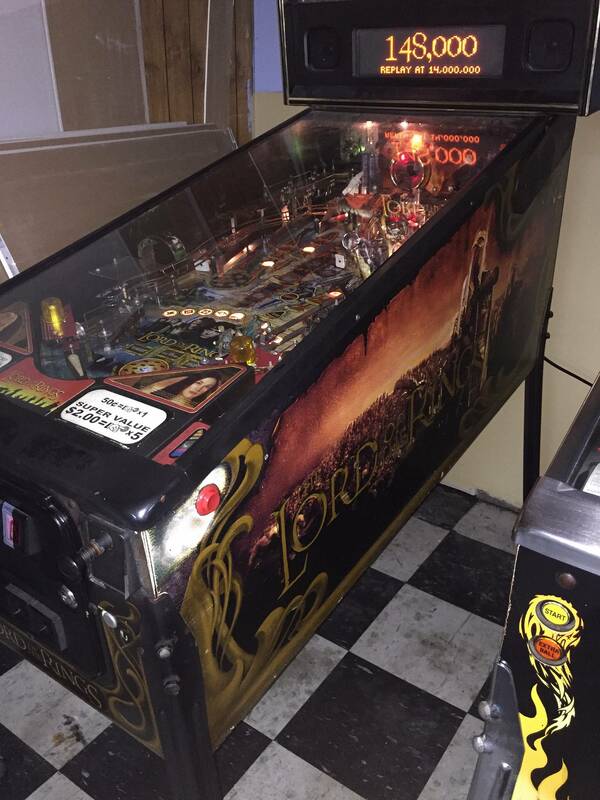 2 Lord of the Rings sold last year on pinside in my area for around $4,500 and both were in much nicer condition than the one you posted pics of . Seems like the one in your pics will need some work , looks like it doesn't have proper sling plastics , the mismatched flipper bats leads me to believe that it was kept going for as cheap as possible and maybe not maintained as well as it should have been . I would not pay much for this machine . If the scared stiff is in this condition as well then it is way over priced at $5,000 . Yep, these were just routed money makers -- no love. If the SS is in this condition, I may just pass altogether unless it's just a stellar deal with room for me to do the work to get them in proper shape. (I really don't like to haggle on this stuff.. I usually just pay or walk away.) I'm just assuming the boards have hacks galore based on some other things I've seen. I think they have a good technician but I think he's in the position to just bandaid everything and send it back out. This LOTR did play, though. I put a couple dollars in, no (functional) issues except for a slightly weak VUK.